Washington remained No. 4 in both the Associated Press and coaches polls Sunday for the second consecutive week. Washington State cracked the Top 25 in both rankings. A 31-24 winner over the No. 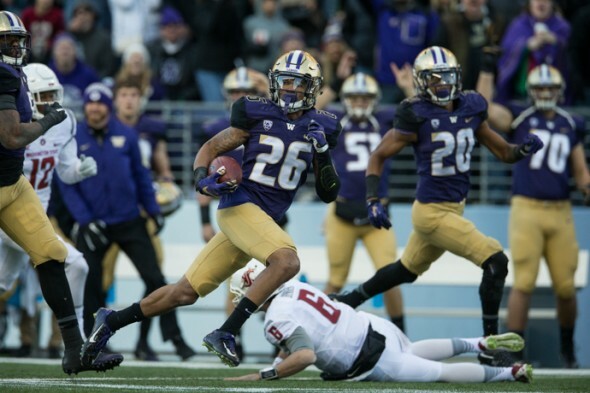 17 Utah Utes Saturday in Salt Lake City, the Washington Huskies remained No. 4 in both the Associated Press and coaches polls released Sunday. The three teams ahead of them were either idle or won. The No. 4 ranking is the highest for UW since the end of the 2000 season, when it finished No. 3. In the Associated Press poll, the Huskies received 1,369 points to trail No. 1 Alabama (1,524), No. 2 Michigan (1,435) and No. 3 Clemson (1,401). The Crimson Tide were idle Saturday while the Wolverines knocked off Michigan State 32-23 and the Tigers narrowly escaped Florida State 37-34. The Huskies had a chance to move into the top three in the AP poll, but Clemson rallied in the final three minutes to defeat the Seminoles. Utah actually moved up a spot to No. 16 in the AP poll despite losing to the Huskies. Among Pac-12 schools, Colorado is No. 21 (375) and Washington State (6-2, 5-0) cracked the Top 25 (139) for the first time at 25th after defeating Arizona State 35-31 Saturday. In the coaches poll, Washington received 1,434 points. Alabama topped the rankings with 1,599 followed by Michigan with 1,492 and Clemson with 1,488. Utah came in at No. 16 with 523. Colorado was at No. 20 (394) and Washington State 25th (146). Washington is 8-0 for the first time since 1992 and 5-0 in conference play for the first time since 1997. The Huskies have not started a season 9-0 since 1991, when they won a co-national championship with Miami. Also Sunday, the Walter Camp Foundation named UW linebacker Azeem Victor the FBS National Defensive Player of the Week. Victor recorded 16 tackles at Utah, 10 solo. Washington plays at California Saturday at 7:30 p.m. (ESPN). The Bears, a 45-24 loser to USC Thursday, are 4-4, 2-3.